The eastern spruce budworm. Source: Wikimedia Commons. Editor’s note: This is the second article in “Soundings,” a series of articles jointly published by The Otter ~ la loutre and the Acadiensis Blog that considers new approaches to history and the environment in Atlantic Canada. The entire series is available here on the Otter and here on Acadiensis. Rachel Carson’s Silent Spring (1962) has had such a tremendous influence on environmental thought that it can seem almost larger than life. It might then be surprising to some to learn that one of the major influences on her study of the effects of the indiscriminate use of pesticides was the small Canadian province of New Brunswick. This connection between Carson and New Brunswick was the result of the province’s emergence as a resource science powerhouse in the years after the Second World War, which was to a great extent intertwined with efforts to control the eastern spruce budworm and save the provincial forestry sector. Indeed, a budworm outbreak in 1945 acted as a major catalyst in what I refer to as the gradual but systematic “laboratization” of New Brunswick landscapes and waterscapes. By the end of the 1950s, this process had proceeded to the point that the province’s laboratized spaces and associated published findings had attracted Carson’s attention. When I originally outlined aspects of this history several years ago, I focused on the scientific work conducted after New Brunswick’s spruce budworm spraying program began in 1952. Silent Spring‘s ninth chapter, titled “Rivers of Death,” focuses on fish mortalities resulting from contact with pesticides in rivers around the world, and it opens with a long section relating the disastrous results of DDT spraying on New Brunswick’s Miramichi River basin in the 1950s. Key to Carson’s case were the monitoring efforts of scientists with the Atlantic Biological Station, particularly C.J. Kerswill and P.F. Elson. Also important was the work of Bruce S. Wright, the founder of the Northeast Wildlife Station. He was the first person to bring scientific wildlife management to New Brunswick, and he saw the effects of the DDT spray first-hand through his wildlife studies in the province’s forests in the 1950s. By limiting my focus only to post-spray studies, however, I missed contexts that I think are vital to understanding the connections between Carson and New Brunswick scientists. I am now convinced that the New Brunswick studies cited in Silent Spring must be understood as part of a broader natural resource scientific community that had been in the province for decades, but which grew exponentially after the Second World War, with the 1945 budworm outbreak serving as a catalyst. This expansion of scientific research was also fuelled by a growing acceptance within Canada throughout much of the 20th century that the state had a key role to play in the ongoing facilitation of resource science. In New Brunswick, this is evident in the creation of a succession of government-sponsored and -funded research institutions and programs, including the Atlantic Biological Station in 1899, the University of New Brunswick’s Forestry School in 1908, what eventually became known as the Dominion Entomology Laboratory in 1912, the Acadia Forest Experimental Station in 1933, and the Northeast Wildlife Station in 1948. With specific regard to forestry, available funds and infrastructure increased considerably with the passage of the Canada Forestry Act in 1949, setting the stage for the dramatic expansion of resource science in New Brunswick in the 1950s and thereafter. 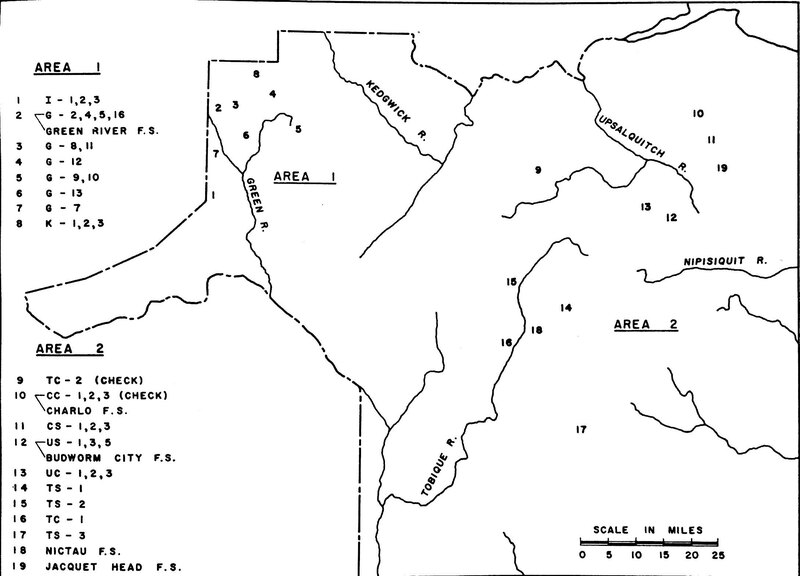 Map depicting the locations of the Dominion Entomology Laboratory’s “Area 1” and “Area 2” sites in northwestern New Brunswick. Source: R.F. Morris, ed., “The Dynamics of Epidemic Spruce Budworm Populations,” Memoirs of the Entomological Society of Canada, no. 31 (1963): 9. Armed with the sense that the province’s forestry-based economy hung in the balance and flush with government research funds, New Brunswick scientists embarked on a wholesale examination of the budworm and its interactions with local ecologies. Scientists with the Dominion Entomology Laboratory in Fredericton led the charge against the budworm. In 1945, with the onset of the budworm outbreak, they established a large experimental area on the Green River watershed near Edmundston. The rationale behind the founding of the Green River project, also known as “Area 1,” was to investigate the life cycle of the budworm and other insects deemed pests, and potentially to discover forest compositions less susceptible to epidemics through silvicultural and forest management trials. Then, in 1952, the first year of the aerial spraying program, federal entomologists established another experimental area containing sprayed and unsprayed areas along the Upsalquitch and Tobique River watersheds. This second research project, known as “Area 2,” allowed scientists to monitor the long-term effects of pesticides – particularly DDT, the principal chemical used in the spraying program for the next decade and a half. Ironically, spraying only prolonged the budworm infestation, which in turn gave scientists more opportunity to study it. A harmful side effect of aerial spraying of pesticides to control the budworm was collateral damage to other wildlife, such as birds. It was discovered in later scientific studies that birds were essential to the natural control of budworm epidemics. The resultant widespread death of birds from spraying diminished rates of predation, helping to ensure that a mid-level budworm epidemic continued without interruption from 1952 until the early 1990s. During this period, scientists followed the budworm moths every year as they moved around the province, gathering massive amounts of ecological data in the process. As early as the mid-1970s, renowned ecologist Buzz Holling intimated that New Brunswick’s budworm research had already generated what was likely the most complete set of long-term ecological data ever about any species. Map of the area of New Brunswick where scientists followed the budworm, gathering massive amounts of ecological data along the way, as defined by Holling, et. al. in the mid-1970s. Source: C.S. Holling (Project Leader), “Project Status Report: Ecology and Environment Project,” International Institute for Applied Systems Analysis Research Reports (1974): 11. Uncovering how New Brunswick emerged as a resource science powerhouse and a major influence on Rachel Carson is important for several reasons. First, it provides us with a deeper understanding of how Carson constructed her case against pesticides – in particular, how she was able to successfully negotiate scientific and ecological knowledge networks, even at the transnational level. Second, it demonstrates how little we still know about the history of science in Canada, despite in this instance strong connections to one of the most important books of the twentieth century. More research is needed especially on the post-Second World War period, when governments in Canada pumped hundreds of millions of dollars into scientific programs as part of efforts to rationalize natural resource management across numerous sectors. Third, this project draws attention to the fact that the barriers between resource and ecological science were not as impenetrable as they have sometimes been portrayed, and actually could often be regarded more as a series of reciprocal relationships, feeding into and reshaping one another over time. Finally, it highlights some of the ways in which the fields of environmental history and the history of science intersect. 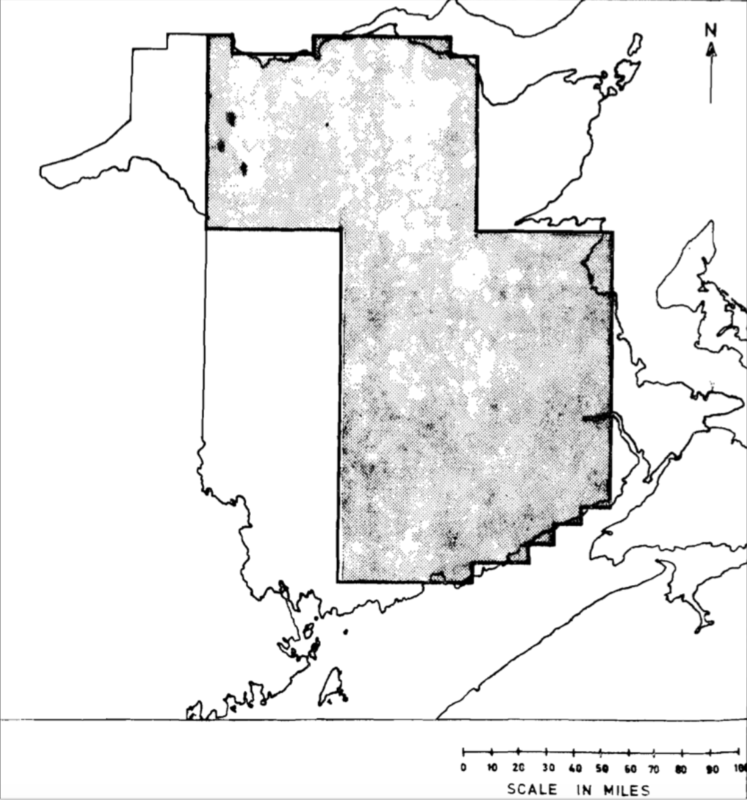 Mark J. McLaughlin, “Green Shoots: Aerial Insecticide Spraying and the Growth of Environmental Consciousness in New Brunswick, 1952-1973,” Acadiensis XL, no. 1 (Winter/Spring 2011): 3-23; and McLaughlin, “The Sound Canadian Science Behind Rachel Carson’s Silent Spring,” ActiveHistory, 27 September 2012, http://activehistory.ca/2012/09/the-sound-canadian-research-behind-rachel-carsons-silent-spring/. C.S. Holling (Project Leader), “Project Status Report: Ecology and Environment Project,” International Institute for Applied Systems Analysis Research Reports (1974): 6.